Updated 10:55 a.m. April 17 Description of Miller added. ST. GEORGE — A 69-year-old man who police say suffers from dementia and Alzheimer’s disease went missing Sunday morning. 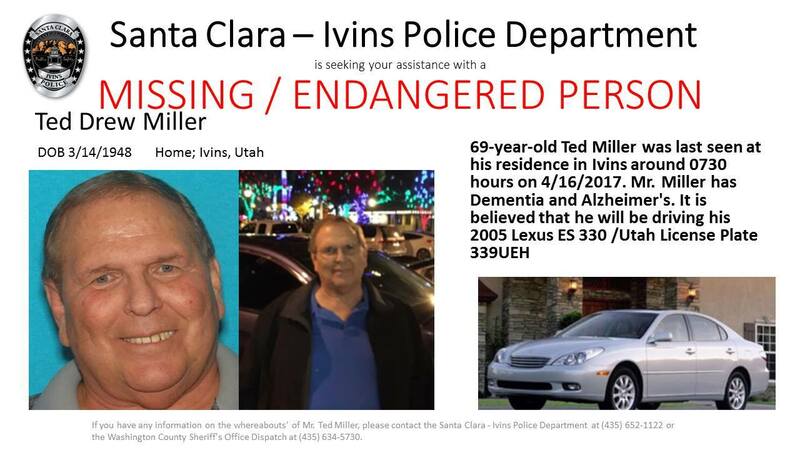 Flyer by Santa Clara-Ivins Police Department with photo and description of missing person Ted Drew Miller and his car. | Image courtesy of Santa Clara-Ivins Police Department, St. George News | Click on image to enlarge. Santa Clara-Ivins Police are listing Ted Drew Miller as missing and endangered. He was last seen at his residence in Ivins at 7:30 a.m.
Miller is described as 5’07”, 225 lbs, blonde and gray hair and blue eyes and was last known to be wearing jeans. He is believed to be driving a silver 2005 Lexus ES 330 with Utah license plate 339 UEH, according to a text message and county wide alert sent by the Santa Clara-Ivins Police Department. Police are asking the public to call 435-634-5730 with any information on the whereabouts of Miller.